MEA Polyurethane Market for Automotive Industry size was over USD 270 Million in 2017 and industry expects consumption above 91 kilo tons by 2024. 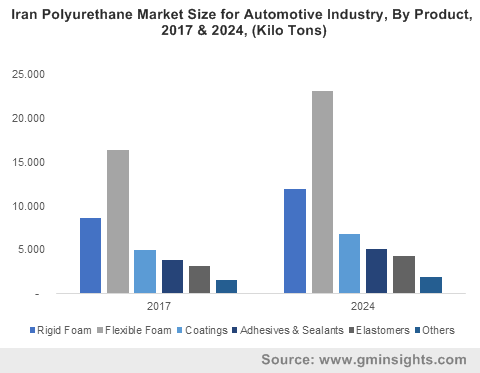 Rising demand for lightweight vehicles, favorable government standards regarding fuel emissions and increasing demand for passenger and commercial vehicles will drive MEA polyurethane market for automotive industry demand. These PU materials are used in vehicle interiors which provides durability and reduces the overall weight of the vehicle, thus reducing the CO2 emissions and enhancing the car longevity. Supporting government norms regarding usage of PU products in vehicles over CO2 emissions along with low cost of product compared to metal counterparts have catalyzed regional industry growth. Polyurethane materials are manufactured using chemical processes by reacting polyols and diisocyanates in the presence of appropriate additives and catalysts. Increased product usage in seat foams, door panels, steering wheels, dashboard and bumpers have led to reduction in overall weight of the vehicle, thus enhancing growth in automobile sales in MEA. High versatility and easy mold ability of the product enables the automobile manufacturers to produce various shapes and design for the vehicles, thereby promoting MEA polyurethane market for automotive industry growth. Rising consumer demand for high-end luxury vehicles including BMW, Audi and Mercedes pertaining to better economic conditions and high purchasing power will promote the usage of polyurethane products in Iran, UAE and Saudi Arabia. Additionally, PU products used in the interior of automobiles helps in minimizing production costs of manufacturers along with making the vehicles competitive in the market. Transport sector is one of the major contributor to CO2 emissions in MEA region. CO2 emission from vehicles contributes over 36% of the total emissions in Morocco, 28% in Jordan, 24% in the Saudi Arabia and over 60% in Libya. Excessive GHG emissions and polluting air quality has propagated the countries to adopt measures for controlling the limits of Volatile Organic Compounds (VOC’s) as a result of providing environmental benefits. Methylene diphenyl diisocyanate(MDI) and toluene diisocyanate (TDI) are reacted with various polyols for manufacturing of flexible and semi-flexible foams which are further utilized in the headrests, armrests, dashboard and seats. Both polyols and diisocyanates are extracted from crude oil or natural oils from renewable resources. The crude oil production in Middle East & Africa accounted for over 33 million barrels of oil per day in 2016, nearly accounting for approximately 30% of the total crude oil production in the world. The development of advanced drilling techniques for crude oil extraction is majorly contributing towards large production of petroleum products. Abundant availability of raw materials along with technological advancements in engineered plastics will drive MEA polyurethane market for automotive industry growth. Polyurethane materials are flexible, lightweight and durable providing excellent cushioning properties along with complete driving comfort and their insulation properties provides high protection against the noise and heat of engines. Many Middle Eastern countries tend to follow the European fuel emission standards which are considered stringent and are majorly contributing to MEA polyurethane market for automotive industry size. MEA polyurethane market for automotive industry size from flexible foams will expect growth rate close to 4.5% by the end of forecast period. These products are gaining huge popularity in the automobile sector owing to its superior properties such as versatility, cost-efficient, lightweight, durability and environment friendliness and has increased usage in truck beds, fenders, cushion interior panels, headliners, headrests and armrests thereby promoting product demand. MEA PU market for automotive industry demand from coatings may surpass USD 80 million by 2024. These products are applied for improving their performance and accentuating the glossy shine to the vehicles along with improved color retention. With innovative coatings technologies, PU products provides UV and thermal stability along with stylish exterior finish. Increasing consumer demand for high aesthetic performance in cars will enhance the demand for PU coatings in the MEA region. MEA polyurethane market for automotive industry size from seat foams will register significant gains close to 5% by the end of 2024. PU based seat foams provides flexibility to the auto manufacturers in creating effective and stylish designs along with complete passenger safety. The rigid and flexible foams incorporated into car seats reduce the foam density of seat cushions along with providing excellent pressure distribution properties. MEA PU market for automotive industry demand from door panels should surpass USD 50 million by the end of forecast period. PU products combined with natural fiber mats provides various advantages such high stiffness and reliability along with impact and corrosion resistance and energy savings. MEA polyurethane market for automotive industry size from passenger vehicles may register growth close to 4.5% over the foreseeable timeframe. Increasing penetration of passenger cars in the region owing to improved economic conditions coupled with high growth in young population and their changing lifestyle patterns will propagate vehicle demand, thereby driving Middle East & Africa PU market for automotive industry size. MEA PU market for automotive industry demand from light commercial vehicles may expect significant gains at over 4.5% by the end of 2024. The demand for PU products in LCV is increasing at a very fast pace owing to rising environmental concerns resulting from heavy fuel emissions and metallic body parts along with stringent standards in the region has promulgated product demand in the region. MEA polyurethane market for automotive industry demand from OEM may register significant growth close to 4.5% by the end of 2024. Increasing automotive vehicle production in Iran, Egypt and Morocco have led to increased usage of polyurethane products by OEM’s to cut manufacturing cost, thus stimulating industry growth. Aftermarket sales in the Middle East region for polyurethane will surpass USD 85 million by 2024. Increasing demand for versatile materials in cars for providing comfort and safety in cost effective manner and minimize scrap generation will further stimulate market growth. Iran polyurethane market for automotive industry demand should register significant growth at over 4.5% over the forecast period. Rising demand for personal vehicles along with strong investments in transport infrastructure facilities will stimulate the transport sector in the country. Additionally, easy access to vehicle finance is promulgating the purchase of vehicles. Iran is the second largest economy in the MEA region followed by Saudi Arabia with better economic conditions and higher GDP. 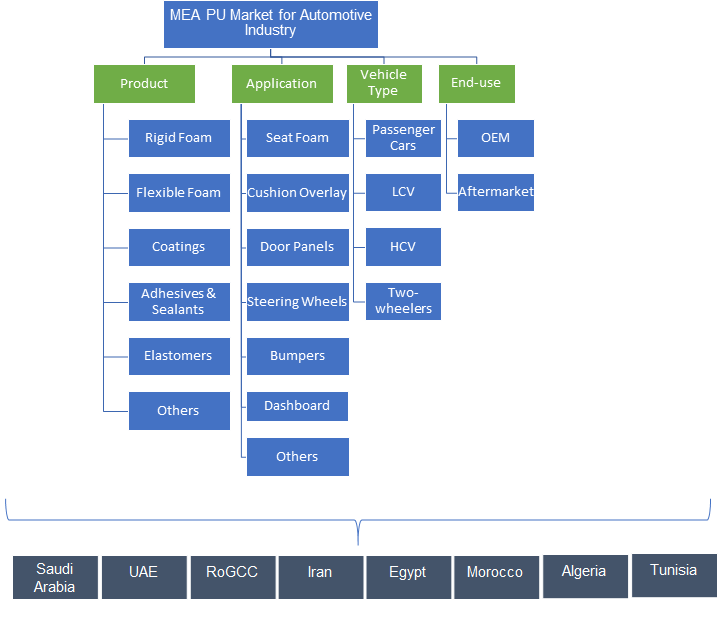 Egypt PU market for automotive industry size is expected to surpass USD 4.4 million by the end of 2024. The automobile sales in the country was over 181,000 in 2017. Rising demand of polyurethane materials from OEM and aftermarket sector owing to its beneficial usage in vehicles will foster the industrial demand. MEA polyurethane market for automotive industry share is moderately fragmented with industry players including BASF, Borealis, Huntsman, Dow Chemical, Dupont, Poly Products, Bayer, Johnson Controls, Deltachem Middle East and Raha Oman. OEM companies are highly engaged in the usage of PU products for manufacturing automobile parts owing to cost effectiveness and lightweight properties. Manufacturing companies are also focusing on forming partnerships and joint ventures to enhance the product offerings and regional presence. Polyurethane are the versatile plastic materials providing extreme durability and flexibility in the manufacturing of various automotive parts. These materials are often lightweight and provides cost effective alternatives against metal counterparts thereby reducing ecological footprint. Dashboard, door panels, steering wheels, cushion overlay, bumpers and seat foams are the major applications of polyurethane in the automobile industry. Rising passenger car production owing to strong purchasing power of consumers is expected to accelerate the MEA polyurethane market for automotive industry growth.